Am I Wasting My Vote? A Quick and Dirty Guide. “You’re wasting your vote!” If you’ve considered not supporting Hillary Clinton or Donald Trump, you’ve probably heard this line. “Voting for Gary Johnson or Jill Stein is a wasted vote! They will never win,” the reasoning goes. As a matter of fact, “wasted vote” actually has a technical definition that will apply to the vast swaths of American voters in 2016. That’s right: if you’re one of the 254 million Americans who live in any of the 42 states (or DC!) identified below, there’s a good chance you’re wasting your vote no matter how you vote—even if you vote for Hillary or Trump. To understand what it means to “waste your vote,” you first need to understand the basics of how a U.S. presidential election works. Here in the U.S. we have what’s called “First Past the Post” elections. This basically means that the candidate with the majority of votes wins the election. Everyone else gets nothing. 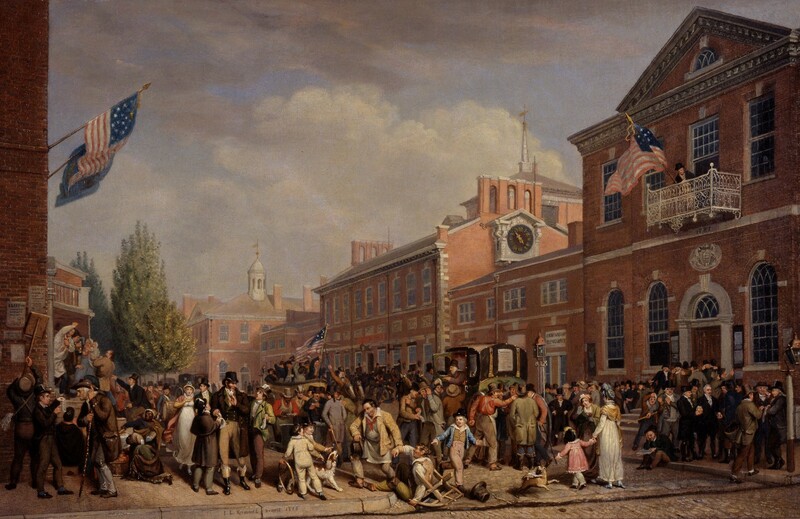 Contrary to common perception, there isn’t a national popular election for presidency. In our system, we have 50 little “First Past the Post” elections in each of the states. The candidate who earns a majority in each state receives a certain number of “electoral votes,” which are generally determined by state size. The loser — even if they receive 49% of the vote in a two-candidate state election— receives zero electoral votes. The electoral votes of all states are then added up and the first candidate to reach 270 wins the presidency. Votes cast for losing candidates or votes cast for winning candidates in excess of the number required for victory. That means, in a theoretical two-candidate, First Past the Post election, every vote for the loser is a wasted vote and every vote for the winner in excess of 51% is also a wasted vote. That’s a lot of wasted votes! In every state that Trump wins, all votes for Clinton are wasted votes. In every state that Clinton wins, all votes for Trump are wasted votes. In every state that Clinton wins, every Clinton vote in excess of a majority is a wasted vote. In every state that Trump wins, every Trump vote in excess of a majority is a wasted vote. This is really all you need to understand in order to follow what comes next. For a more comprehensive explanation, check out Stephen Wesse’s fantastic piece on FEE. Those states where Clinton has a 75%+ chance of winning are blue. Clinton will absolutely win a majority in these states. Those states where Trump has a 75%+ chance of winning are red. Trump will absolutely win a majority in these states. Those states where neither candidate has a 75%+ chance of winning are green. Something resembling an election is still underway in these states. To be less exact: to switch the winner in red or blue states, something dramatic would need to happen—think a candidate’s death or an intervention by an advanced alien species. Every single Trump vote in a blue state will be a wasted vote, since he will lose and receive no electoral votes. Every single Clinton vote in a red state will be a wasted vote, since she will lose and receive no electoral votes. A marginal Trump vote (i.e., your vote) in a red state will be a wasted vote, since he will receive those electoral votes with or without your vote. A marginal Clinton vote (i.e., your vote) in a blue state will be a wasted vote, since she will receive those electoral votes with or without your vote. In green states, there’s at least an itty bitty chance that a Clinton/Trump vote won’t be a wasted vote. 3) Ugh, Just Answer the Question! If you’re in a yellow state, your vote is almost certainly a wasted vote even if you vote for Trump or Clinton. The takeaway? Vote for the candidate who most reflects your views. Cynically voting for the “lesser of two evils” is completely irrational in these states. 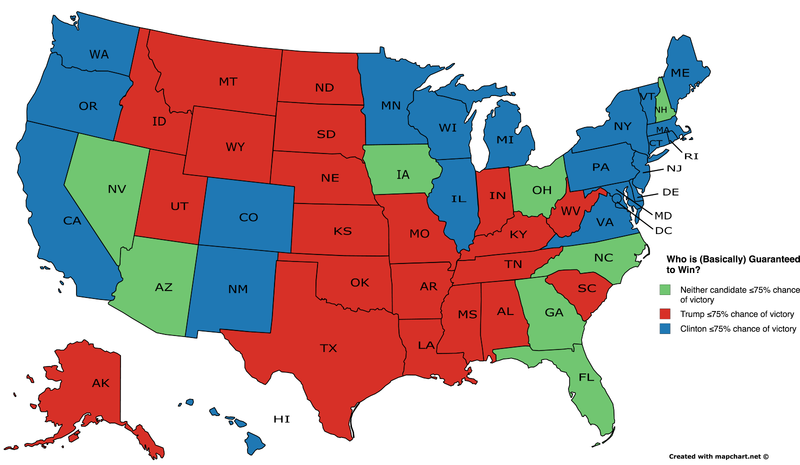 If you’re in a purple state, it’s marginally less irrational to engage in “lesser of two evils” thinking. Since the elections are somewhat close, there’s at least the remote possibility that you could impact the outcome of the election. Not a great reason to throw away your dignity and vote for Clinton or Trump, but it’s at least in the realm of reasonable if you strongly prefer one over the other. 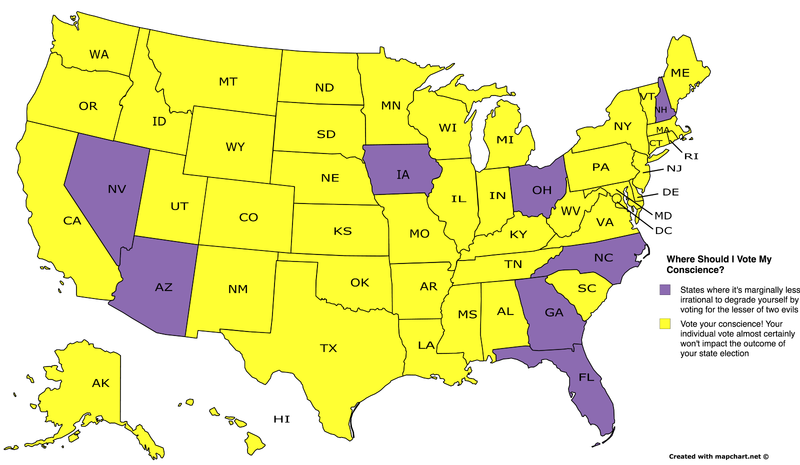 If you’re one of the 79% of Americans who live in a yellow state: congratulations! Your state’s election is for all intents and purposes decided. In these states, it is completely irrational to vote with the hope of affecting the election outcome. You should vote for the candidate that best reflects your views, whether that’s a Republican, Democrat, Libertarian, Green, Constitution, or one of the dozen or so regional candidates. The next time someone accuses you of wasting your vote by voting for a third party, you can smugly relax knowing that your accuser doesn’t understand the basics of how U.S. presidential elections work. Even if you live in a purple state, you should by no means feel compelled to vote for one of the two major parties. As I mentioned above, cynically voting for the lesser of two evils is only marginally less irrational in these states. Which is to say, it’s still irrational. There are plenty of great reasons to vote, but voting to affect election outcomes—even in tight elections in small states—isn’t one of them. 4) But Wait, There’s More! Let’s play around with the idea of a “wasted vote” for a moment. If your goal is to change the winner of the 2016 U.S. presidential, a vote for a third party—as well as a vote for Trump and Clinton—is almost certainly a wasted vote. But there are other potential goals that may transform a third party vote into the most rational way to vote. Hear me out. Let’s say you’re among the 60% of non-crazy Americans who think we need a viable third party. The two biggest hurdles facing rising parties like the Libertarian Party and Green Party are ballot access and campaign funding. Concerning ballot access: in many states, receiving a measly 5% of the vote in the state presidential election guarantees ballot access for the party in the next election. That means, for example, that if 1% of Nutmeggers voted for Jill Stein, the Green Party candidate would enjoy automatic ballot access in Connecticut in 2020. If 1% of New Mexicans vote for Gary Johnson, the Libertarian Party candidate would enjoy automatic ballot access in New Mexico in 2020. Similar rules are common among the states. Ensuring automatic ballot access means lifting huge burden off of third parties. Concerning campaign funding: It has been argued that a third party receiving 5% of the national vote could mean the end of the two-party system. That’s because upon receiving 5% of the national vote, parties qualify for generous federal campaign funding in the subsequent election. Receiving this funding in the 2020 election would give your preferred third party a sizable budget to work with in taking on the two major parties. Whether we’re talking about 1% at the state level or 5% nationally, both of these outcomes are possible for Gary Johnson and Jill Stein. You might not be able to change who wins the 2016 presidential U.S. election, but your vote could go a long way toward chipping away at two-party control of U.S. politics.